Where can you find great salad recipes? The Bald Chef has some great salad recipes you may enjoy! There are many types of salad recipes ranging from garden salads, Coleslaw, steak salads, chicken salads, and fish salads. Other great salad recipes include salads that are made from pasta such as shrimp pasta salad, chicken pasta salad, and vegetarian pasta salad. Some salads like the 3 bean salad relish the use of beans or grains. 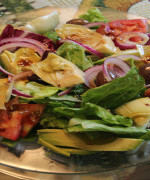 This section of The Bald Chef’s web site features great salads and the recipe to make fantastic creations. Most green salad recipes call for different types of lettuce such as Romaine, Iceberg, and radicchio is an Italian lettuce. Always try to use local grown vegetables that are organically grown for the best health benefits. The Bald chef uses supper foods like Hass avocados, olives, artichokes, and healthy salad dressing in many of his recipes. To make a great salad you need to know the recipes for salad dressing. Some great salad dressing include Ranch, 1000 Island, Balsamic Vinaigrette,Italian, Honey Mustard, Bleu Cheese, and Caesar salad dressing. The Bald chef is working to post more links to his salad dressing section.